How to set the adequate PEEP ? Use it to the fullest! 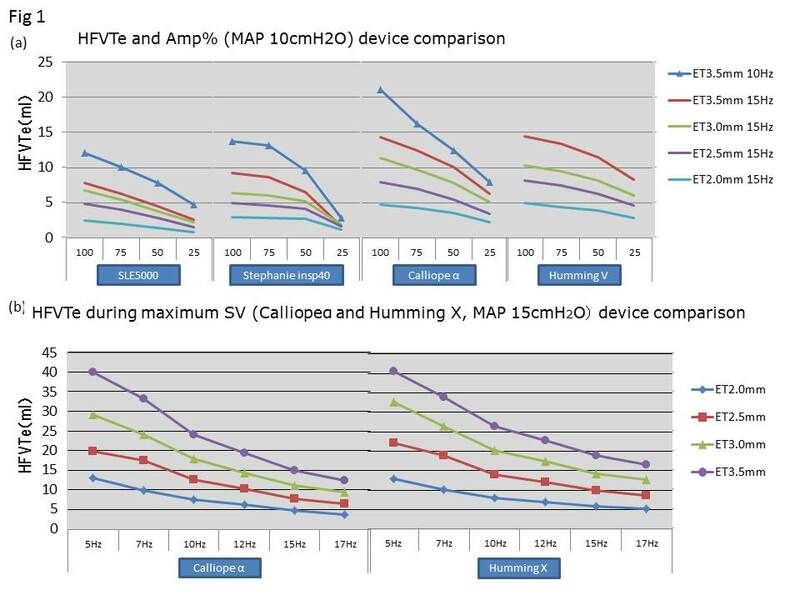 Figure 1-a shows tidal volumes for each 25% HFO output depending on intubation tube diameters when the maximum amplitudes, generated by CALLIOPEα and HUMMING V belonging to piston type HFO machines and by SLE5000 and STEPHANIE belonging to non-piston type HFO machines, were preset as 100%. CALLIOPEα can obtain clearly larger ventilation volume than the other machines when first of all comparing at oscillation frequency of 15 Hz. 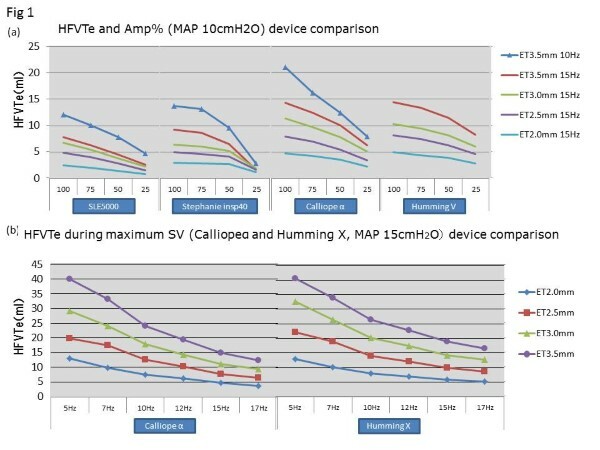 In addition, no great difference in the maximum power from HUMMING V as a piston type HFO, but it is found that CALLIOPEα has linearly increased ventilation volume depending on the output. SLE5000 also shows linear changes in ventilation volume by increases in output are linear compared with STEPHANIE but is inferior to CALLIOPEα in view of absolute values. However, 15 Hz of oscillation frequency is recommended for piston type HFO machines, while 10 Hz is frequently recommended for non-piston type HFO. Comparing recommended oscillation frequencies, SLE5000 is not bad. Then, comparison of oscillation frequencies at the time of maximum output between CALLIOPEα and HUMMING X (Figure 1-b) shows that HUMMING X has higher oscillation frequency by about 25% than CALLIOPEα particularly at 15 Hz and is confirmed to have more power than CALLIOPEα. This indication for ventilation volume shows only one aspect of mechanical ventilators and the superiority cannot be judged by only this indication. Particularly even though the same ventilation volumes were obtained from piston type and non-piston type HFOs, it is not directly linked to oxygenation or CO2 emission ability. 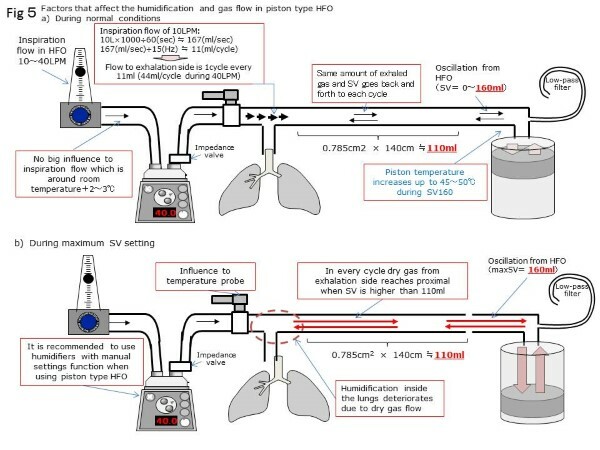 Even when there was a limitation to non-piston type HFO, it should be kept in mind that switching to piston type may cause rapid improvement in respiratory state. 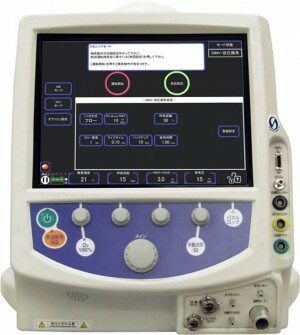 Generally, the backup ventilation for neonatal mechanical ventilators means the function applied to spontaneous respiration mode without mandatory ventilation, such as CPAP and PSV, but the backup ventilation is applied to SIMV mode in this machine, too. 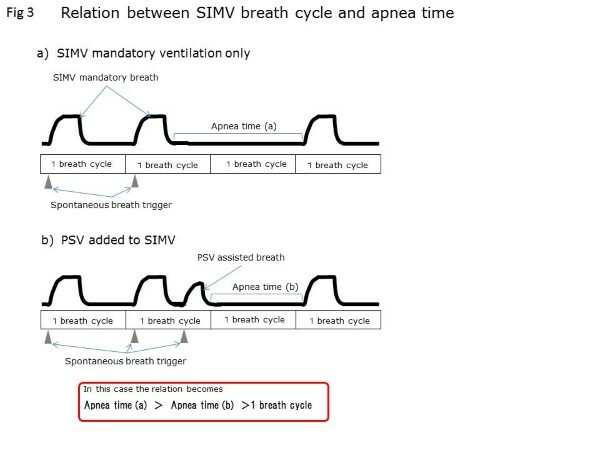 For example, when presetting of SIMV+PSV is applied to SLE5000 (Figure 2-a) and ventilation frequency is 15 times/minute, PSV simply disappears and only mandatory ventilation by SIMV is carried out during apnea. On the other hand, in HUMMING X, by presetting backup ventilation frequency on ventilation-presetting screen (Figure 2-b, 25 times/minute in this figure, too) and presetting apnea time on the alarm-presetting screen, mandatory ventilation depending not on ventilation frequency of SIMV but on backup ventilation frequency is carried out (Figure 2-c). Alarm sounds accompanying on this occasion are slightly noisy and they are a drawback, but this may be a reasonable mechanism considering the respiratory physiology of premature children who repeat spontaneous respiration and apnea even under mechanical respiration control. Then, when alarm confirmation button is push or spontaneous respiration revives, original SIMV+PSV return. When apnea time is preset in SIMV, for example when SIMV ventilation frequency is 20 times/minute, one respiratory cycle (60 seconds ÷ 20 times/minute) ranges 3 seconds and therefore activation seems not to occur unless the apnea time is less than 3 seconds. However, in reality, longer apnea time can be preset. HUMMING X can be designed to prolong the apnea time. In SIMV with HUMMING X, the HUMMING X is designed to carry out 0 to 2 times mandatory ventilations per respiratory cycle. Then because the time remains in the respiratory cycle even after completion of mandatory ventilation finally triggering spontaneous respiration (Figure 3-a), the time that next respiratory cycle is added can be preset as apnea time. 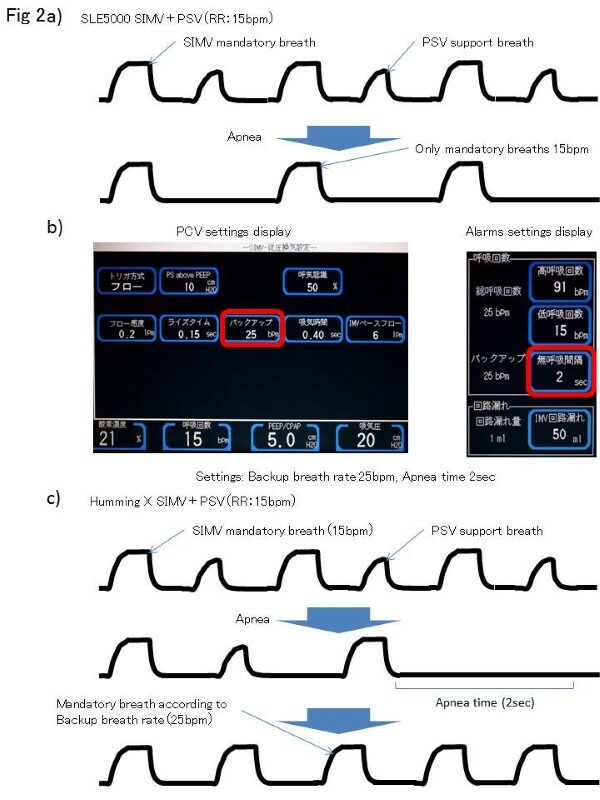 Moreover, the length of apnea time becomes different depending on whether the last respiration was mandatory ventilation by SIMV or assist ventilation by PSV, too (Figure 3-b). In reality, for example if SIMV ventilation frequency is 20 times /minute, the apnea time can be preset up to 5 seconds to the maximum. On the other hand if the apnea time is 3 seconds, SIMV ventilation frequency can be preset as 35 times. HUMMING X sometimes shows pressure waveform of longer inspiratory time than usual during ventilation by PSV (or SIMV+PSV) (Figure 4-a). This is because no leak correction function for expiration termination sensitivity exists in PSV mode of HUMMING X. Generally, when presetting the inspiratory flow peak as 100%, inspiratory time is adjusted by turning from inspiration to expiration at the time when the inspiratory flow decreases to a certain rate from the peak flow (this rate is termination sensitivity). This is the mechanism that patients can expire any time they want to expire (Figure 4-b-i). 2) How about PSV termination in the other machines in the presence of tube leak? If tube leak is present in PSV and the flow base line exceeds the termination sensitivity due to leak, finish of expiration by termination is not attainable. 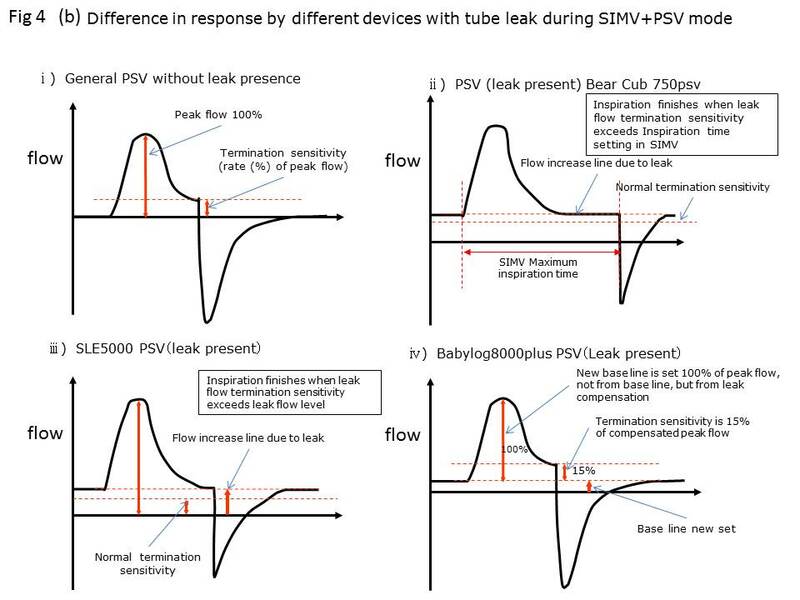 Therefore, for example, the mechanism of BEAR CUB750psv is the one that inspiration finishes when attaining preset maximum inspiratory time (Figure 4-b-ii). The mechanism of SLE5000 is the one that termination (finish of inspiration) occurs when inspiratory flow lowers to the level of flow base line, which has elevated over the termination sensitivity. 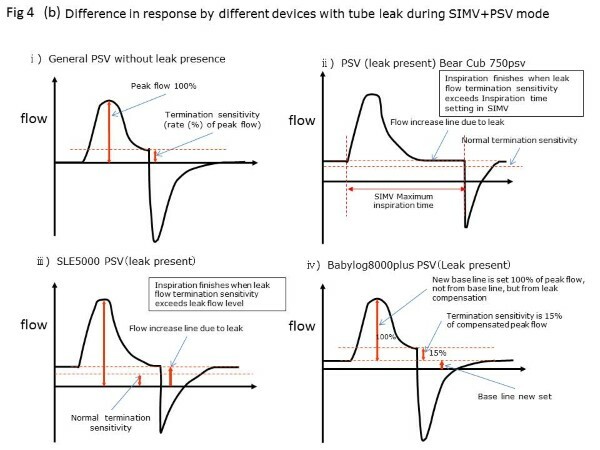 In the Babylog8000plus, flow base line is always re-adjusted by leak correction against tube leak and the peak flow reaches termination at 15% when re-adjusted flow base line is defined as zero (Figure 4-b-iv). Therefore termination sensitivity is auto-adjusted instead of lack of adjusting function for termination sensitivity. In this regard, the Babylog8000plus is most excellent. 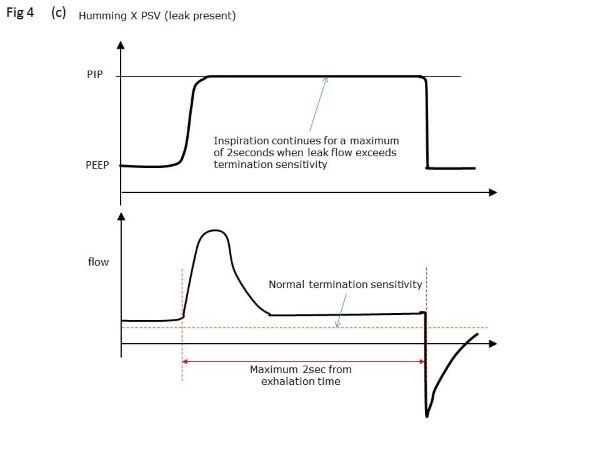 In the HUMMING X, there is no leak correction mechanism for PSV termination and, also concerning establishment of upper limit of maximum inspiratory time, the upper limit is not established for maximum inspiratory time in SIMV and backup ventilation. Therefore, when large tube leak hinders expiratory termination, inspiratory time of 2 seconds to the maximum may result (Figure 4-c). Long inspiratory time in the figure shown first is caused by this situation. 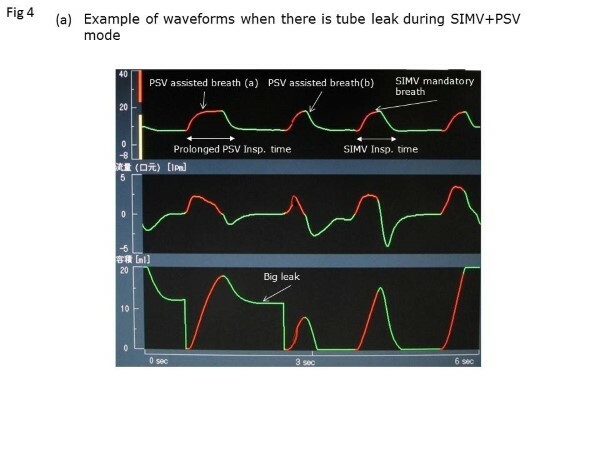 Thus, when applying PSV (or SIMV+PSV) to HAMMING X, users must pay full attention to tube leak. Although there is a possibility that higher termination sensitivity than usual makes this phenomenon hardly occur, users should pay attention to the possibility that when the leak is not much, faster shifting to expiration than usual, namely, the situation -insufficient for patients to inspire- may be produced. In HFO mode, inspiratory flow becomes larger from 10 to 40LPM than usual ventilation. On the contrary, the piston oscillates within the range of preset stroke volume (SV) and the air-flow transmits as oscillating flow from the expiratory side. When the inspiratory flow is 10LPM, the flow advances by ca. 167 mL per second. Considering oscillation frequency as 15 Hz, the flow advances each 11 mL per oscillation cycle to the expiratory side (Figure 5-a). 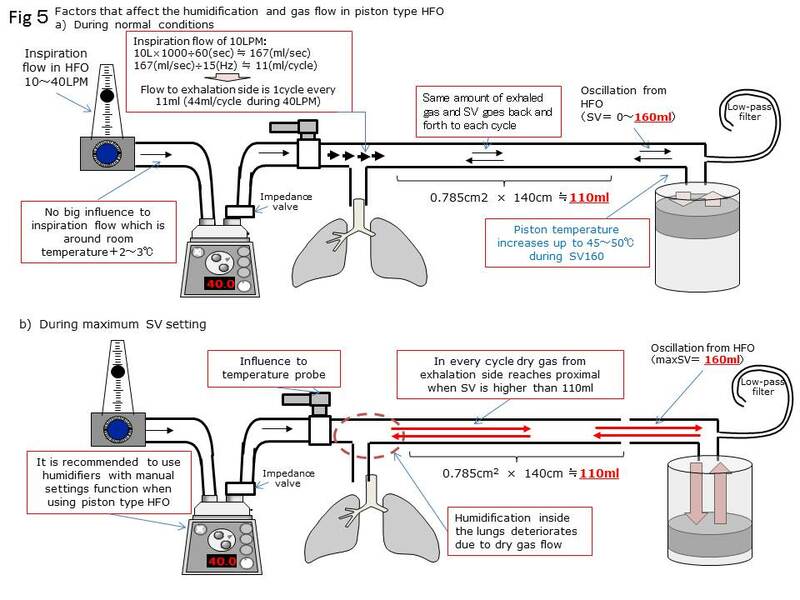 Although the case that the SV is small proportionally to expiratory circuit capacity (ca.110 mL) is not problematic, low humidification becomes problematic when the SV approximates to preset upper limit (Figure 5-b). This is because oscillation occurring on expiratory side transmits to the vicinity of Y piece along with dry gas. Therefore, use of an auto-controlled heating and humidifying apparatus may generate low humid state. For HUMMING X, use of a heating and humidifying apparatus, in which chamber temperature and mouth side temperature can be separately controlled, or a heating and humidifying apparatus which has wide temperature control is desirable. Among heating and humidifying apparatuses manufactured by Fisher & Pykel, MR850 is more suitable than MR730. By the way, as instructed concerning the meaning of SLE series restrictors in SLE5000, Application Version, a restrictor is set near a mouth side Y piece in SLE series and this makes non-problematic mechanism. It is the impedance valve previously instructed which has the same action as the restrictor. The HUMMING X has flow sensors respectively inside the machine body and on mouth side. Each sensor performs calculation of trigger or leak volume. Basically, mouth side flow sensor is given priority and machine body sensor does not work during wearing mouth side flow sensor. When mouth side flow sensor is taken off, machine body flow sensor works but cannot measure ventilation volume. 1) HUMMING X Instruction Manual, Metran Co., Ltd. Copyright Aomori Prefectural Central Hospital NICU All Rights Reserved.